Seeing wildlife in Borneo is a highlight of any visit to this tropical island. Remarkably human-like orangutans hide deep within the jungle and pot-bellied proboscis monkeys sit high in the trees. Pygmy elephants move through the rainforest and at dusk, flying lemurs soar from one branch to the next while millions of bats stream out from some of the world’s largest caves. The list of wildlife in Borneo is rich and varied: sun bears, crocodiles, elephants, gibbons, monkeys, bearded pigs, civet cats, leopard cats, hornbills, kingfishers, barking deer, mouse deer, frogs, lizards, snakes, slow lorises, elusive clouded leopards and western tarsiers, and so much more. Some, such as proboscis monkeys, can only be found in Borneo. Sightings of wild animals are never guaranteed but whatever you’re most hoping to see, we can advise you where to go to increase your odds. As wild animals tend to move around and there’s such a variety of wildlife in Borneo, we recommend visiting a combination of rehabilitation or conservation centres, national parks, and preserved areas. Learn about the largest tree-dwelling ape, the orangutan, at Sepilok Orang Utan Rehabilitation Centre or Semenggoh Nature Reserve. Drift down the Kinabatangan River looking for crocodiles and proboscis monkeys. Take a night walk through Bako National Park keeping an eye on the trees for a flying lemur, civet cat, or slow loris, and along the trail for frogs, snakes, and spiders. Sit outside Deer Cave as the sun sets in Mulu National Park to watch the sky fill with millions of bats heading out for their nightly hunt. Wake early at Tabin Wildlife Reserve and follow the sound of gibbons to the forest edge. If it’s pygmy elephants you’re looking for, book an extra day in Sukau, Tabin, or Danum Valley and hope that luck is on your side. Everywhere you go, look out for hornbills, owls, eagles, and the ever-cheeky macaques. Below are just a few sample itineraries and suggestions of places to stay where you may encounter a bit of wildlife in Borneo. For more details or to inquire about a holiday in Borneo, give us a call at UK 020 7112 0019 or email borneo@fleewinter.com. Our expert has spent months visiting lodges, nature reserves, rehabilitation centres, and national parks looking for wildlife and great places for a holiday. The most reliable places to see the "man of the forest" are Semenggoh Nature Reserve and Sepilok Orang Utan Rehabilitation Centre. Daily feedings draw the orangutans to platforms where you can watch and take photos. When fruits are in season, roughly the months of October-February, the apes are less likely to visit the feeding platforms. At Sepilok, there's still a good chance to see young orangutans in the nursery. Seeing pygmy elephants is a highlight of any holiday to Borneo. The animals are completely wild so there's never a guarantee you'll see them. 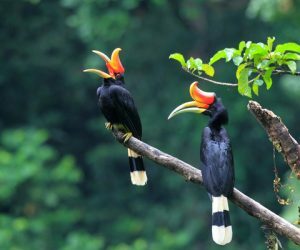 Places to look include the Kinabatangan River, Danum Valley, Kawag Danum, and Tabin Wildlife Reserve. 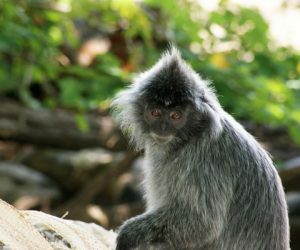 The silvery lutung, also known as a silver leaf langur, can be spotted along the Kinabatangan River, in Bako National Park, and in other mangrove and river-rich areas. We recommend a stay in Sukau to look for these. 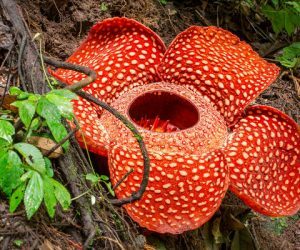 The world's largest flower, rafflesia blooms can be found in Mount Kinabalu Park in Sabah and in Gunung Gading National Park in Sarawak. The flowers only last 4-6 days and can bloom at any time of year so there's a bit of luck involved in getting to see one. 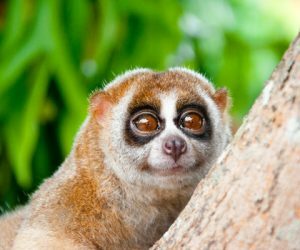 The nocturnal slow loris is very tough to spot but if you do see one, there's a good chance you'll have a moment to watch it as they are usually quite slow! We recommend a night walk in Bako National Park, dusk drive in Tabin Wildlife Reserve, or a night cruise in Sukau. The state bird of Sarawak, the Rhinoceros Hornbill is found across Borneo. Look for these birds along the Kinabatangan River, in Tabin, Danum, Bako, and Batang Ai. The Iban people of Batang Ai ascribe special meaning to these birds so look for carvings and representations in the area. With jungles, rainforests, unusual animals, clear oceans, and a rich cultural tradition, Borneo offers an adventure for families of all ages. This trip takes in a bit of traditional culture and then focuses on wildlife viewing. Release baby turtles, spot orangutans and monkeys along the river, look for colorful birds in the jungle, and get a taste of the underwater world - without swimming if that's your preference! Borneo's waterways were once the primary means of transportation. Today, they're a great place to look for wildlife. This itinerary takes you along the Sarawak River, to the waters of Batang Ai, in search of proboscis monkeys on the waters of Brunei, along the Kinabatangan River to look for crocodiles, orangutans, and more, and ends with a chance to see one of the most biodiverse underwater areas in the world.